Made a quick video of PhCNC running a board. 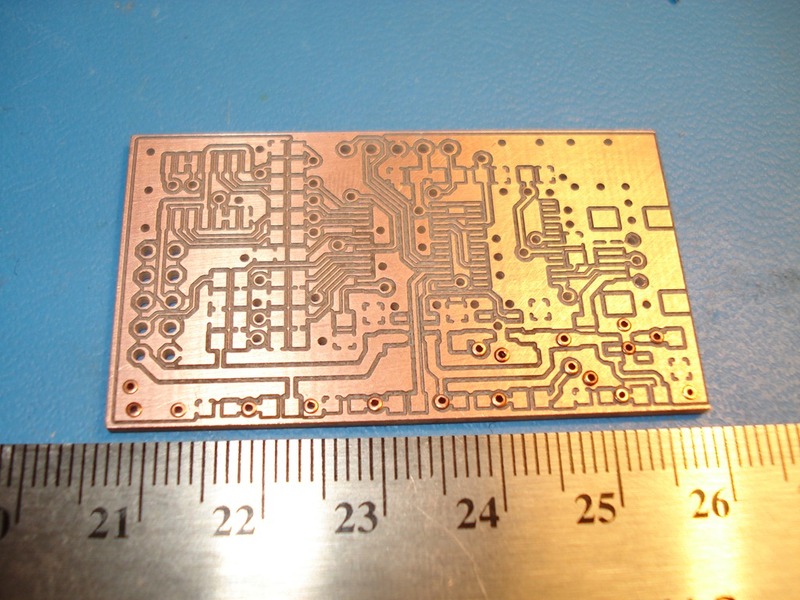 I used a BusPirate V3 board to test out these rivets. 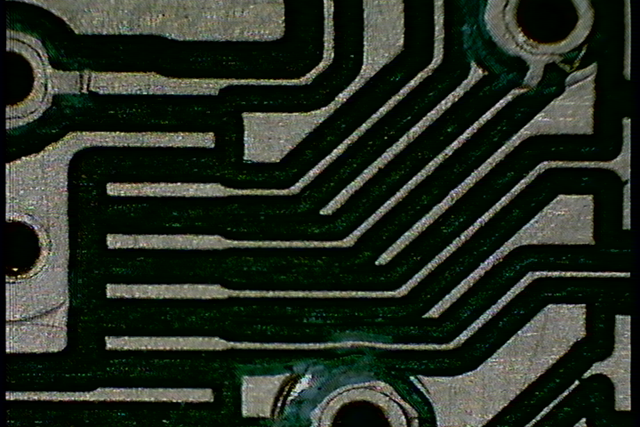 They are effectively thru-plating for PCB’s, normally you need to do messy multistage chemical stuff to do it at home. 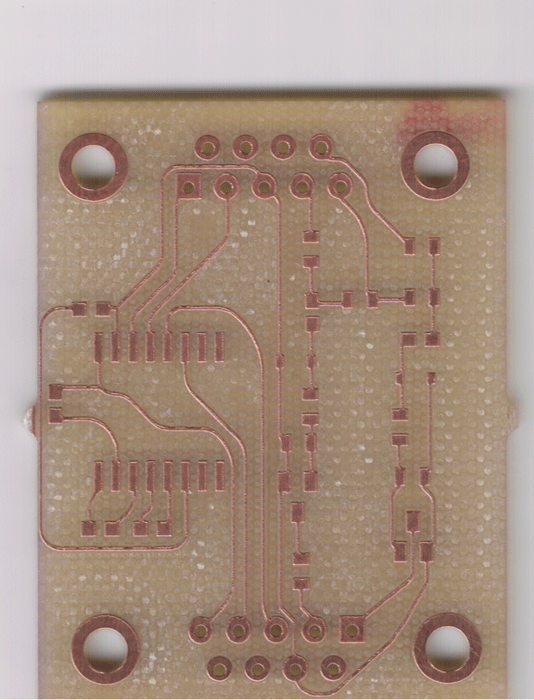 This isn’t as good a result as a chemical plate but it makes up for it in ease of use. 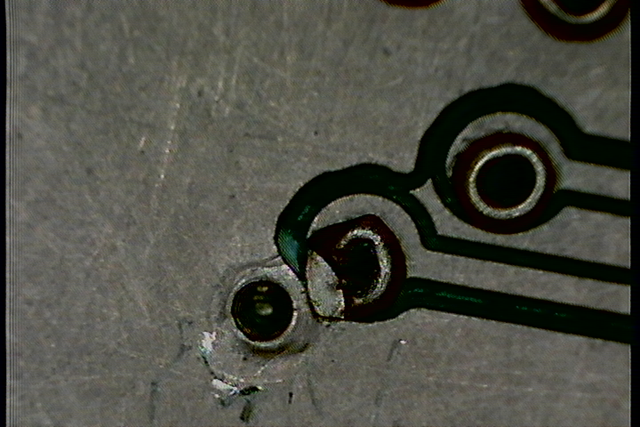 It’s not the cheapest option, which is usually just using a bit of wire in the hole and hand soldered in, but that can cause problems with VIA’s under flush mounted components. 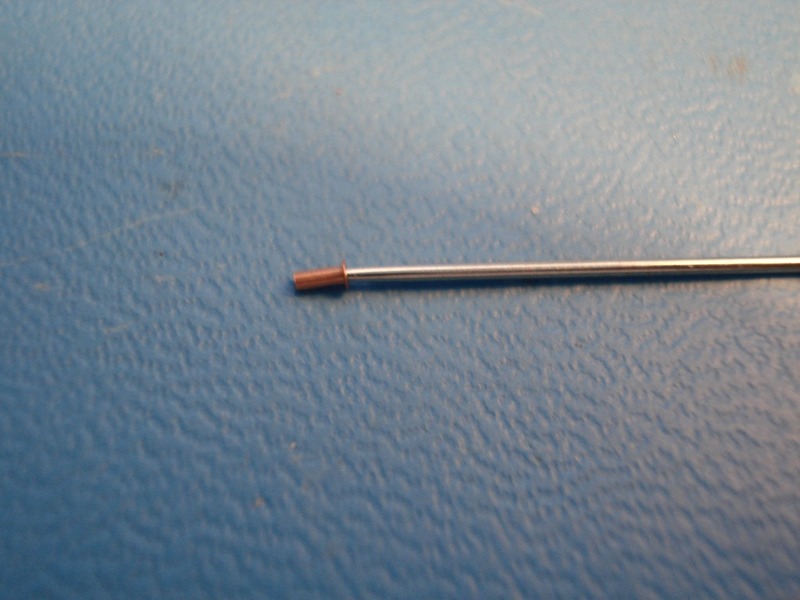 Basically you put a rivet in the hole, flip it over and hit with an automatic center punch. Here are some of the results so far. 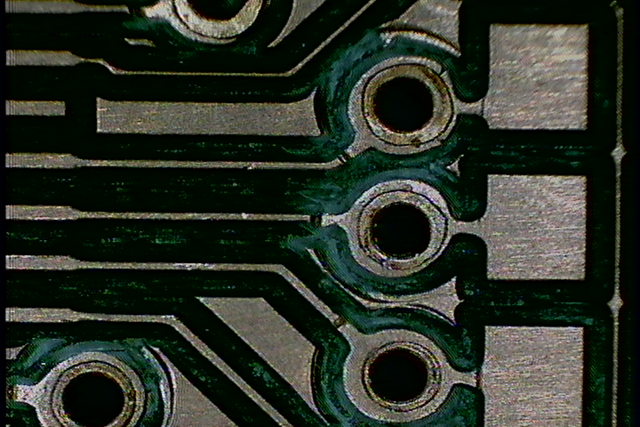 I didn’t spend as much time as i ought to have aligning the backside of the board, so the drills are slightly off. Bottom side, they take up less space on the side that’s being compressed. I used a needle to insert them one a time, a wire strung with a bunch might work. 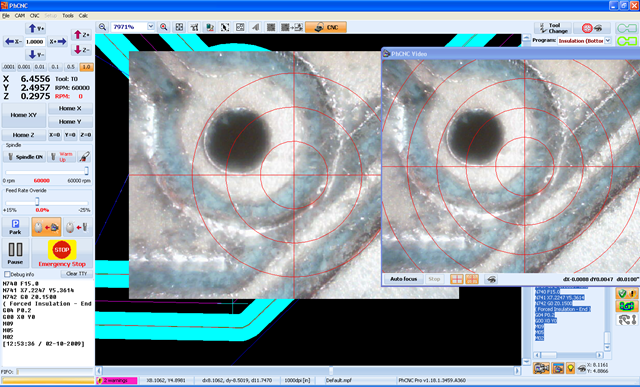 some closeups with the HiView wireless usb microscope, because of the way it works you see black rings where there is really copper if its an angle. This one went funky, needs some after attention, I didn’t put the center of the punch in the rivet ! So these guys work solely via (pun intended) their mechanical connection to the clad? yep, but given the pressure involved they’re not going anywhere. 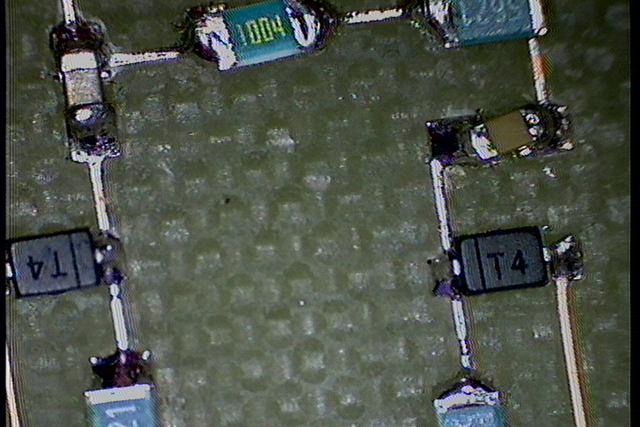 Plus you can make the via pads bigger and solder them too. they practically fuse. they’re pretty expensive here too. 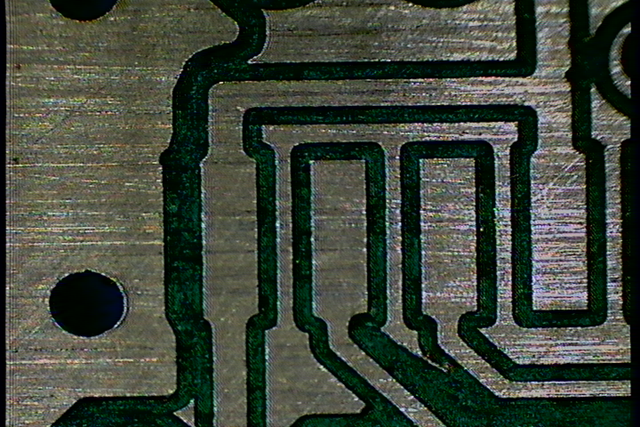 Though its got some funky routing :) and i didn’t quite drill all the way through, this board seems to be right. I redesigned it a bit and recut it, a small error in one of the rubout tool changes. 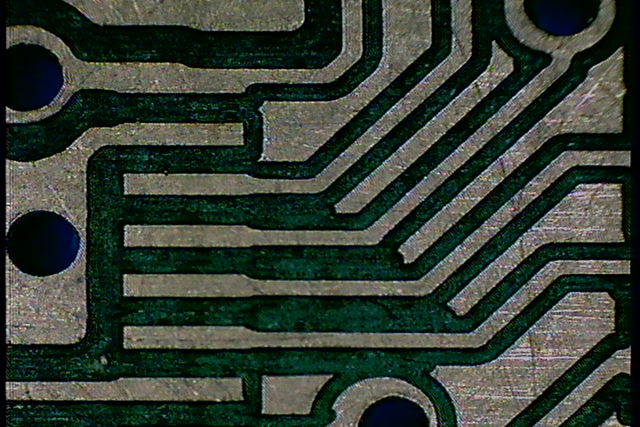 The main thing i wanted to get rid of was the trace in the middle left, that cuts through an 0603 package, though on the new one one of the transistors traces is going back under itself. 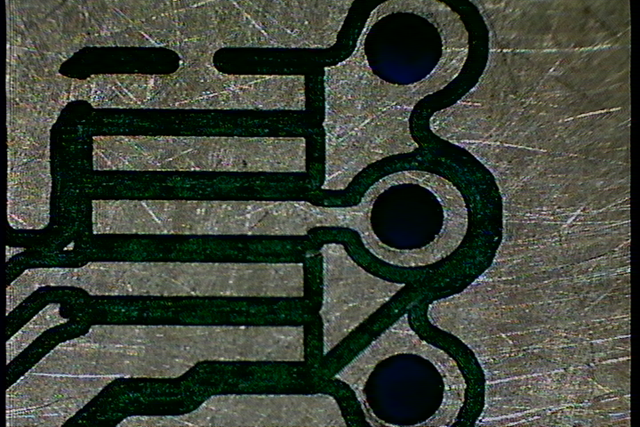 I also scanned this one at 2400DPI, seemed to work better..
end mill of increasing sizes and just remove the parts not wanted. 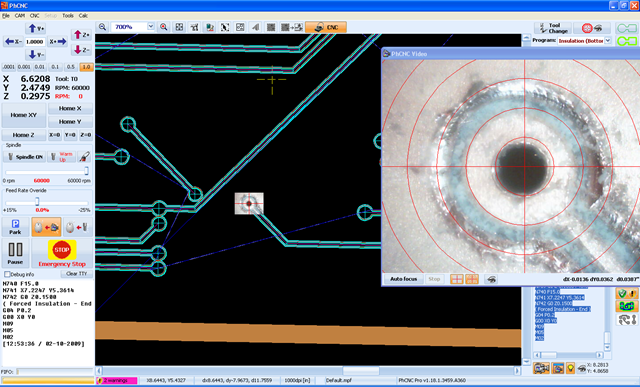 How are you setting the routing depth? I am working with an AccurateCNC 366 and after homing in the z-axis directly over the working area, the bits are still routing way too deep. Almost all the way through the board, completely through in some areas. Also, how are you securing the working material? Right now, I am using double sided tape behind the working area and taping the edges of the working material down. 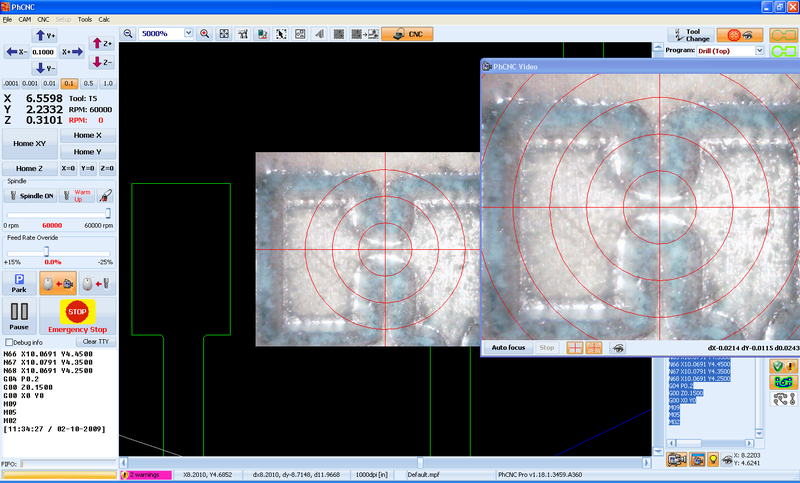 then use the camera to do the test cut and then the size of the cross it cut should show you the cut size. 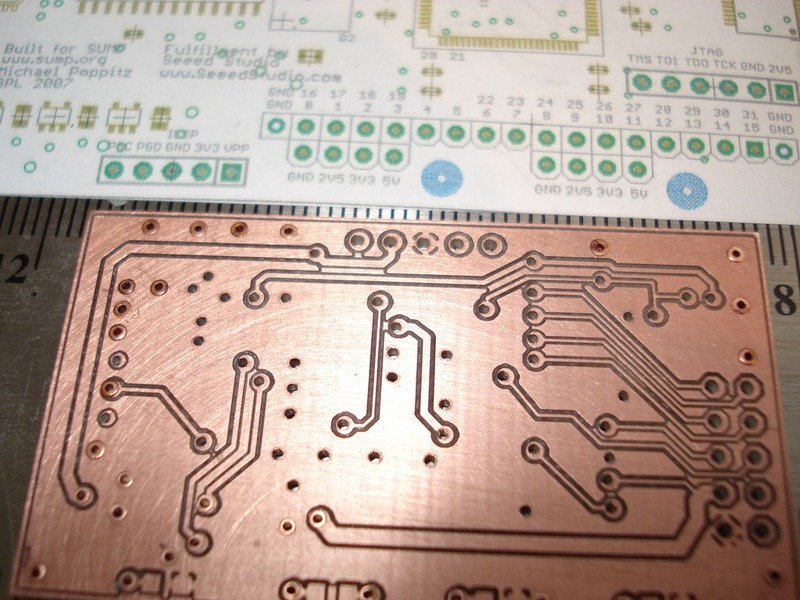 the pcb should be flat, its a floating head so it’ll handle changes, but best to be sure. 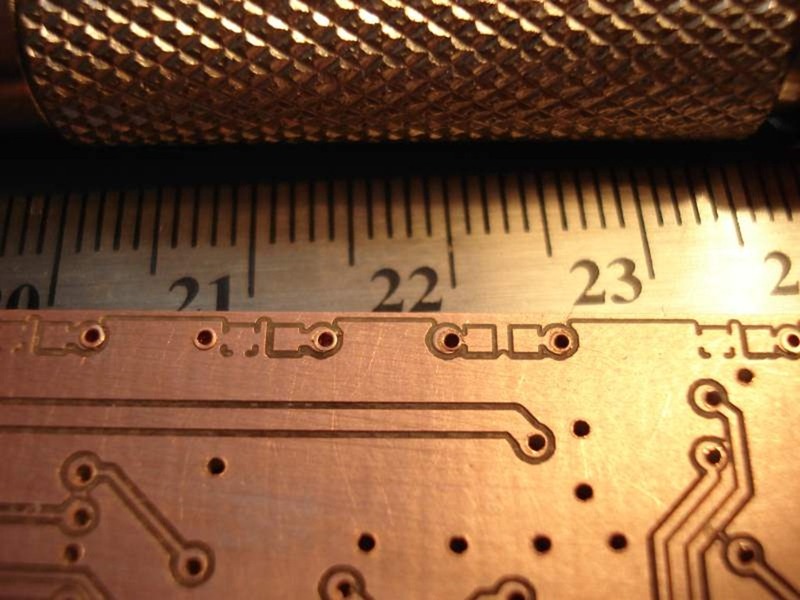 i use double sided tape , not carpet tape since the threads get caught up, and clear tape around the edges of the pcb, so long as the head dooesn’t have to ride on it. 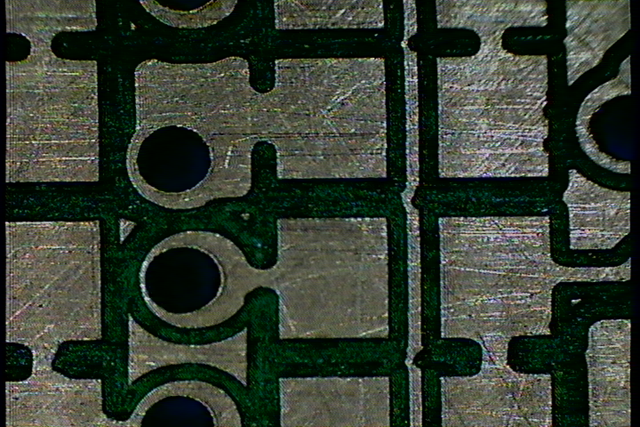 Cut testing, Pictures of the fiducial registration mode. 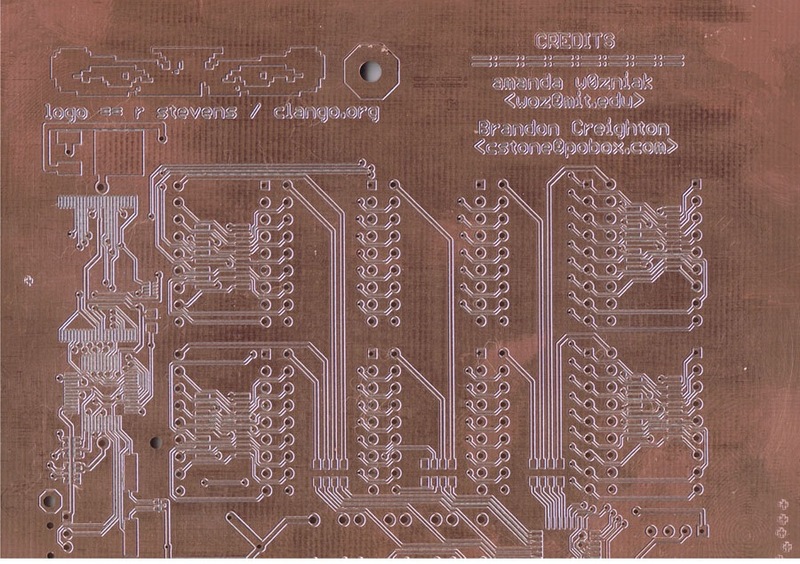 The double sided PCB’s are helped out by the camera, you basically find two drill holes, align the camera to one, find the drill hole that matches on the gerber , centre the cursor on that , right click and it moves the Gerber’s to match, second hole does the rotation. 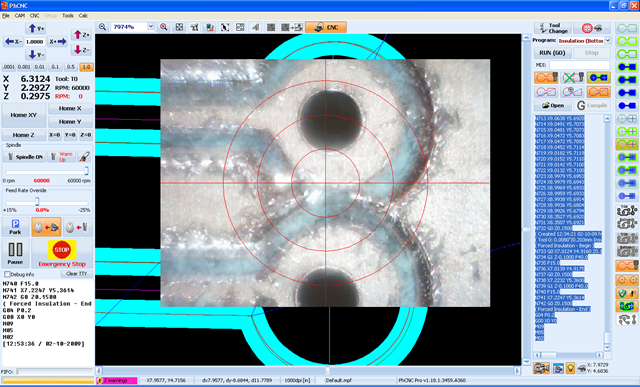 Not deep enough, These next images are after the double sided cut , checking alignment, the blue areas are the drill path, the black is the copper left, as you can see they match up pretty good. Then just match up the red circles as close as possible. I’ll post more details on this, but it looks like a great success. 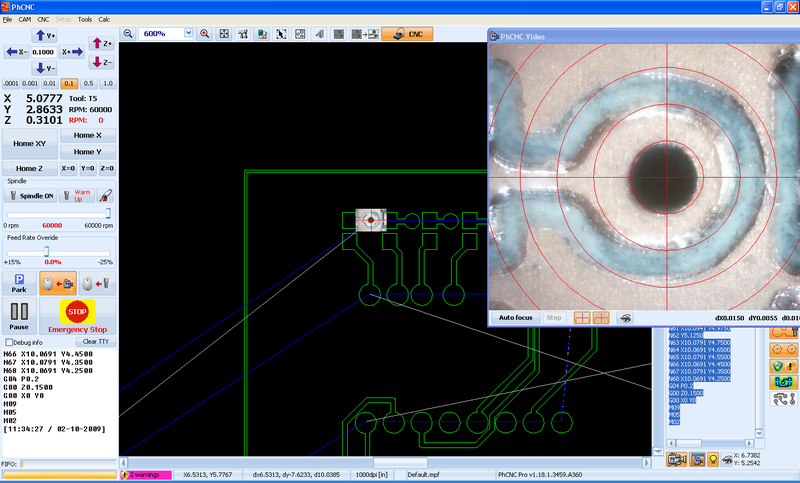 The routing of the circuit isn’t yet complete, its just a quick 10mil auto trace in eagle. 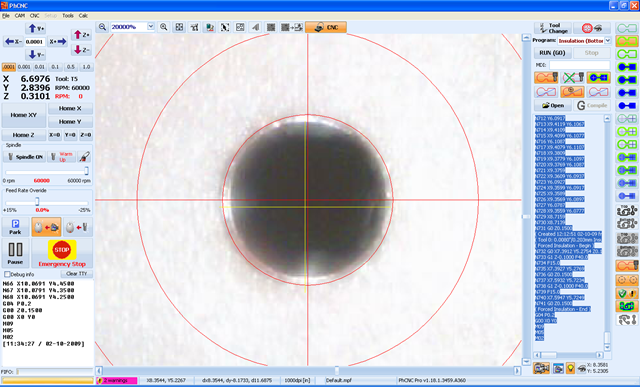 what CNC did you use? I’m trying to make machine like that.. But I’m happy with the progress. 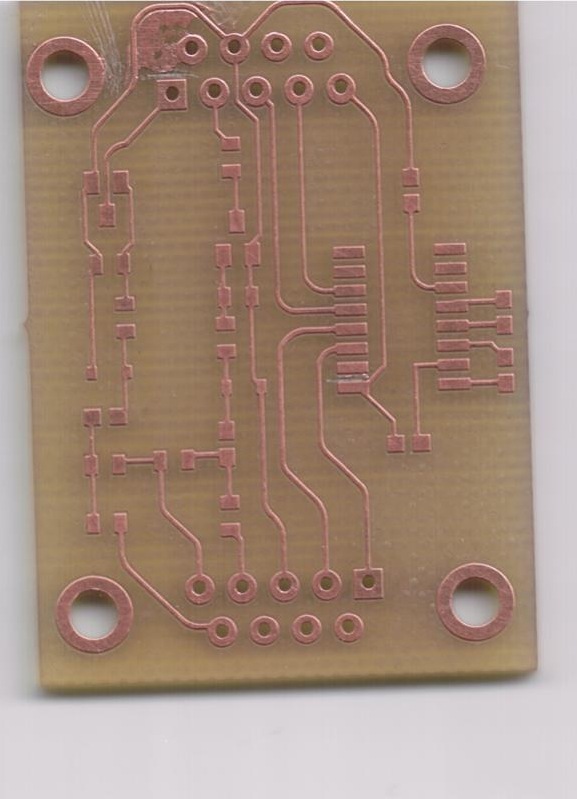 This is a fairly complex board with some small traces and it had some DRV’s so its not unexpected that it failed in some parts, and i did run it through twice. 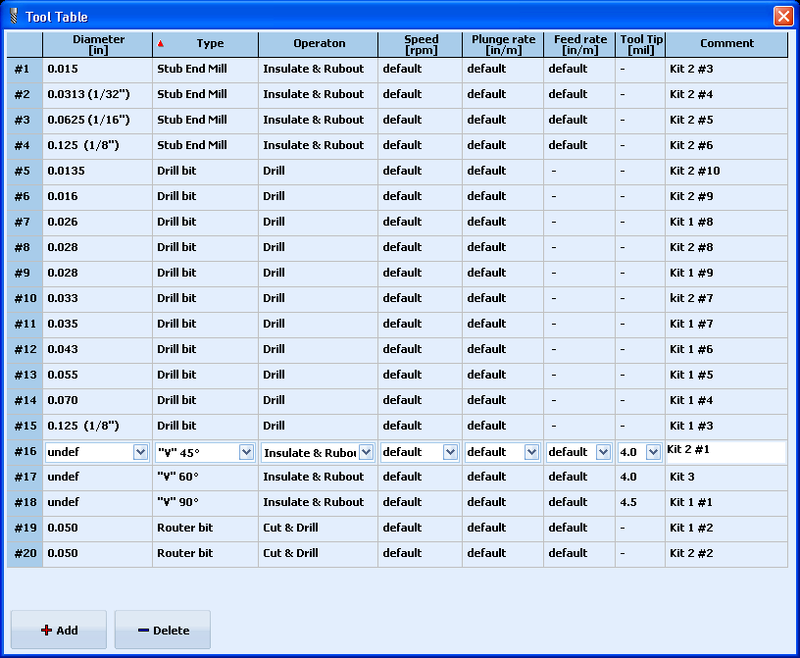 Changing the drill bits isn’t that hard, and I still dislike imperial, the software shows things in inches, and not mil’s or cm and not mm’s, the drill bits are marked in mils, so just shift it left so not a big deal, its just annoying switching back and forth, I didn’t realise AccurateCNC offered a metric version, wish I’d realised beforehand, though its just really the micrometer. The Z axis/depth setting for the bit seems to be sticking a little bit, so I have to watch that when I’m setting a depth. 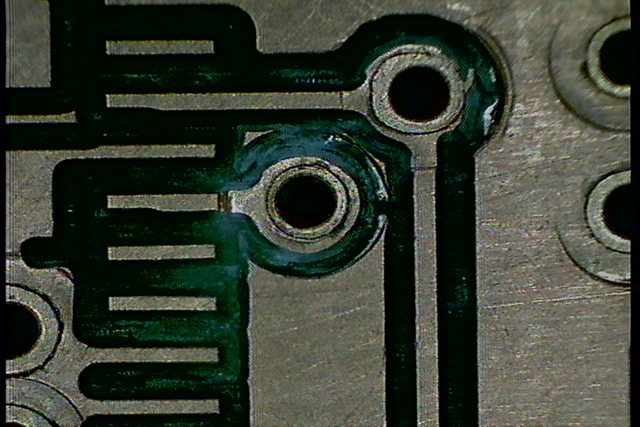 For drilling depth, I kept a piece of PCB that is the same as the one mounted, and just measured the depth from that. 1. Camera chase mode, be nice if it automatically switched on the video feed if its not on. 2. DRC/DRV, if there any it warns you with a popup box, especially about the forced isolation mode being off, I’ve missed it a few times and the board will likely not cut properly. Probably a good reason, but I don’t see it yet. 3. USB camera doesn’t work well if there are two cameras on the same hub ,even on 2.0, haven’t tried it on a separate bus yet. 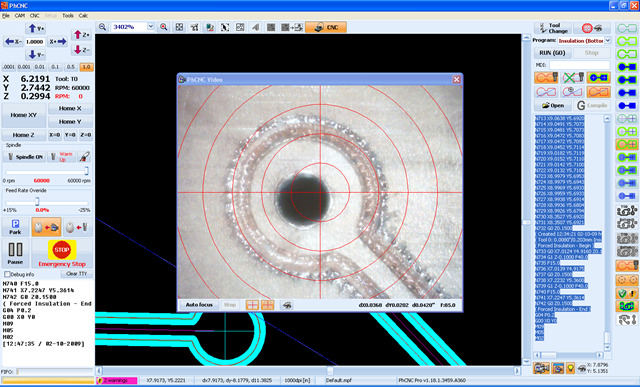 Really not that big a deal, remote monitoring the CNC. Likely nothing to do with the PhCNC. 3. Resizable video window, it gets in the way, you can make go away altogether, but I’d like it smaller sometimes. 4. Video viewable in CAM mode, i use mplayerc.exe for this (Media Player Classic), you just have to keep switching and it doesn’t do the light/autofocus. 5. Ability to record/remember each of the previously captured camera locations, that way you can build a larger area or refer back to it when you’re elsewhere with the camera, so a bitmap layer. 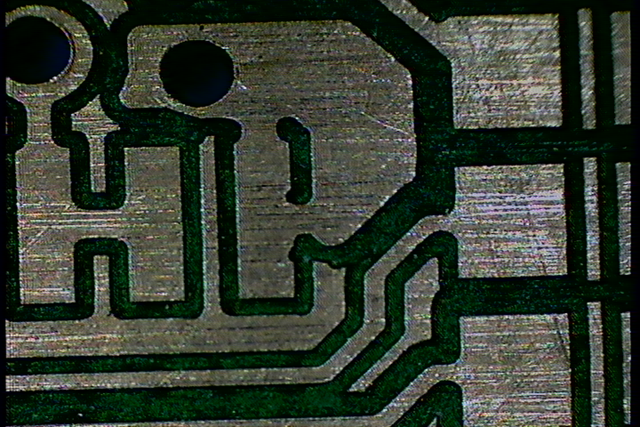 I also noticed that when I did the thumbtacks for the mounted PCB boundary to lay the cut in CAM mode, when flipped to CNC mode, the image mirrors horizontally but its no longer inside the thumbtacks, not sure why yet. Ever since Defcon I promised to get her indoors a Ninja Badge, I got hold of one by fixing one of the bad ones, but I gave it back to the guy who won it in the Q&A in the HHV, the answer being charlieplexing, which I’d shouted out being too late to have heard the rules.. Luckily the good guys behind the design uploaded all the schematics and Gerber files, so easy to reproduce one. 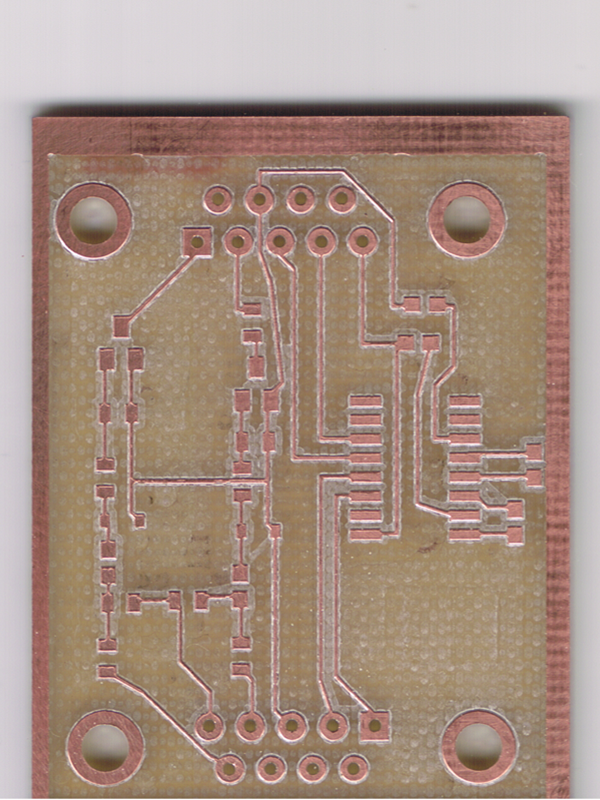 I had another go at it this morning, I did tool tests at each corner of the PCB and got the depth as it looks like it ought to be, but the board came out much worse than this one… I probably need to verify the minimum trace size, but i couldn’t get a full copper cut with a smaller trace.Oh well the learning process goes on. 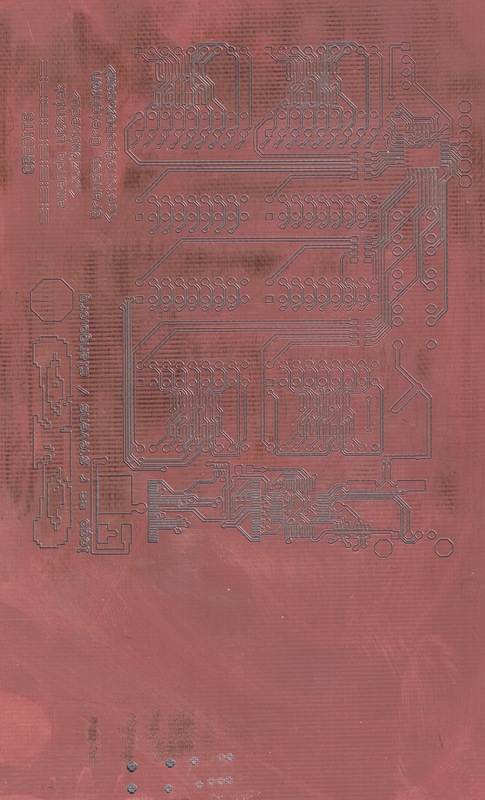 I just hope the worlds supply of PCB material holds out, I’ve already emptied out our local Fry’s Electronics.